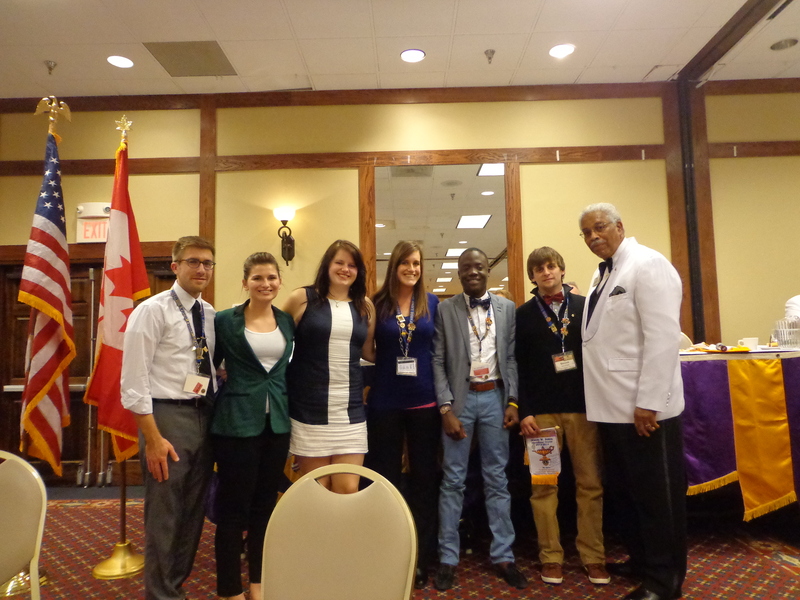 Six NDSU campus Lions who attended the 2013 North Dakota State Lions Convention were recognized by International Director Stacey Jones of Florida for their commitment to service and their future promise as leaders in their communities and professions. ID Stacey Jones was a charismatic representative for LCI at the convention. From the first time I met him, his intense, personal focus and his well-chosen words of encouragement and support were captivating. At the Saturday evening banquet, when he looked into the students’ eyes and shook their hands, they later told me they didn’t want him to stop. The power of a leader looking into the eyes of the next generation and telling them that they were important and are making a difference in the world was immeasurable. 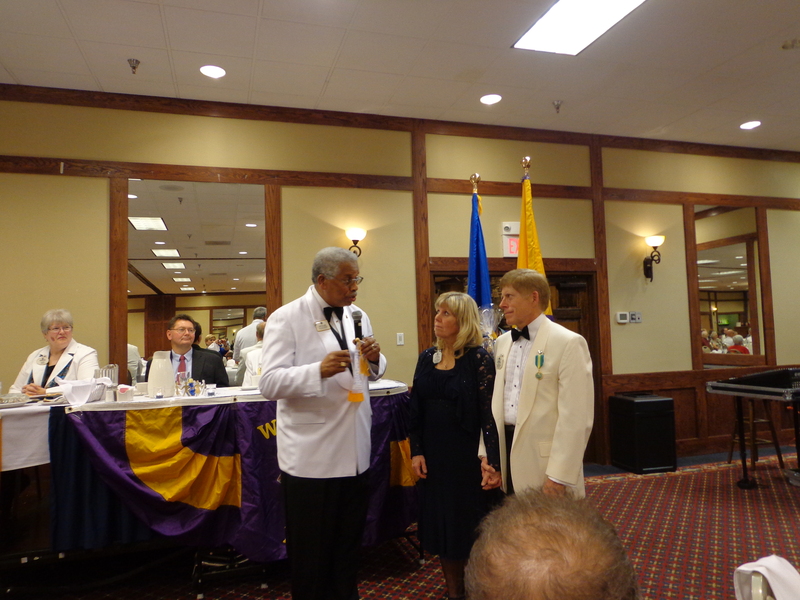 I believe this convention experience profoundly changed their understanding of just what a fantastic and important international organization Lions Clubs International is. The six students were part of the delegation from Fargo on hand to generate enthusiasm for my official endorsement to run for the office of International Director of Lions Clubs International. I was so proud of them throughout the convention as they fully participated and added an exciting dimension to the activities. They distributed “calling cards,” carried signs and placards, gave out candy bars, and were greeters at the “meet and greet” room. From all reports, they had a great time and everyone they met found them to be outstanding role models. Their spirit lifts mine and reminds me daily why I love being a Lion! Two of the students, Lion Jade Monroe (left), currently a senior and serving as Zone Chair for 6A and Lion Shane Hofer (right), also a senior and campus club President, spoke on my behalf at the ND State meeting. Their words were from the heart and humbling. Later, they were very open in crediting me with making a difference in their lives as a role model, teacher, advisor, and friend. As a college professor, I meet hundreds of students every year and get to know many of them pretty well. However, few have ever told me as directly and sincerely about how they feel about me as these students did at the convention. I know that they will be part of my life always. As for Kathy and me, ID Stacey recognized our leadership in developing programs for youth, including the Lions Speaking Contest held in conjunction with the convention. His friendship banner wished us continued success and happiness in Lionism; and he thanked us for our service. As we reflected on this past weekend’s activities, Kathy and I are thankful to be serving with such great Lions and friends in North Dakota, particularly: The Fargo Lions who nominated me, the NDSU campus Lions who lift my spirit, the Lions of 5NE who launched my candidacy with the official district endorsement, the Lions of 5NW who provided a resolution of support, and the ND Past District Governors Association who unanimously endorsed my candidacy at its business meeting. We now are looking forward to openly continuing with our campaign across Multiple District 5 over the next seven months and hope as many Lions as possible can be in attendance to celebrate the very best of Lionism as we gather to endorse an international director candidate for 2015. In closing, to all who share the motto “We Serve!” we extend our very best wishes. It’s definitely go time. Please know that Lion Robert has already contributed more than anyone else I know to Lions and that as an International Director he will bring energy, ideas and a hard work ethic to the world.